Excessive temperatures pose health risks to the community and environment, and impact on business productivity. Godfrey Street is a laneway in the western part of Melbourne’s central city. Thermal imagery taken in 2010 shows Godfrey Street is a hot spot. Heat is retained in the road, pavement and surrounding buildings. What did the greening project involve? 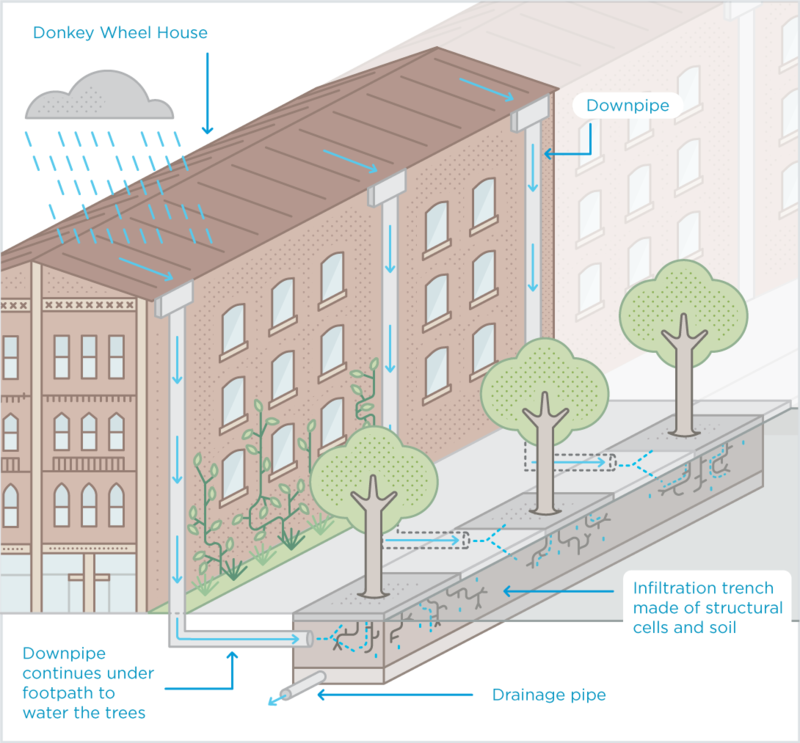 We redeveloped Godfrey Street Laneway to cool it by adding trees, vertical greening and rainwater irrigation. We also improved amenity by reducing the road from two lanes to one. This created a larger pedestrian space and allowed for street café trading. 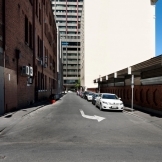 Rainwater is now collected from the roof of a large building on Godfrey Street and diverted into a trench of structural cells beneath the footpath. This allows rainwater to passively irrigate trees in the trench. Some rainwater is also diverted to a new garden bed at the southern end of the street. A green façade was also included in the streetscape design. It grows up the side of the Donkey Wheel House building from a garden bed at the base of the wall. The garden bed provides a small increase in the permeability of the footpath. Once fully grown, the green façade will provide additional cooling in the street. The owners of the adjacent café maintain the garden bed, and also use it to grow herbs. The project was a partnership between the City of Melbourne and the Victorian Government, which provided $350,000. What benefits has the Godfrey Street greening project provided? Increased soil moisture, supporting tree growth. Reduced the volume of stormwater going into the Yarra River. Revitalised an underused laneway into a welcoming place for pedestrians. Improved opportunities for local businesses and amenity for residents. Increased the amount of public open space in the densely populated western region of the central city. 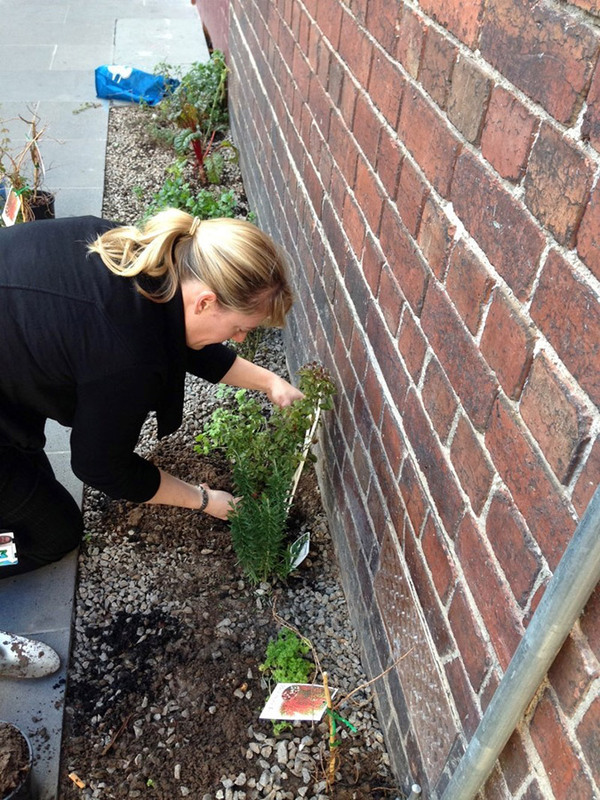 The Godfrey Street greening project has shown how Melbourne’s iconic laneways can be adapted for a changing climate. The Donkey Wheel House is a large building that occupies approximately half of the eastern street frontage along Godfrey Street. Rainwater is captured on the roof of the building and flows into five downpipes, spaced along the façade. The irrigation system redirects rainwater from these existing downpipes to trees and gardens in the street. We have redirected three of the downpipes into an underground channel of structural soil and structural cells beneath the pavement. Runoff from the footpath is also directed into the channel via a grill in the pavement. We have planted trees along the channel. When the water soaks into the structural soil it passively irrigates the trees. The roots of these trees are able to grow freely along the channel, giving the tree a stable base and encouraging vigorous canopy growth. At the southern end of Godfrey Street, stormwater is diverted from two downpipes on Donkey Wheel House into a roadside gutter that flows into a garden bed. This provides passive irrigation to the shrubs and trees in the garden bed. It also removes pollution from the water. In heavy rain, excess water is able to flow out from the garden bed and into the stormwater drain. This prevents flooding. Godfrey Street was used as a test case for the use of water sensitive urban design and vertical greening in a laneway setting. 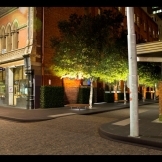 The Godfrey Street greening project has shown how Melbourne’s iconic laneways can be adapted for a changing climate. 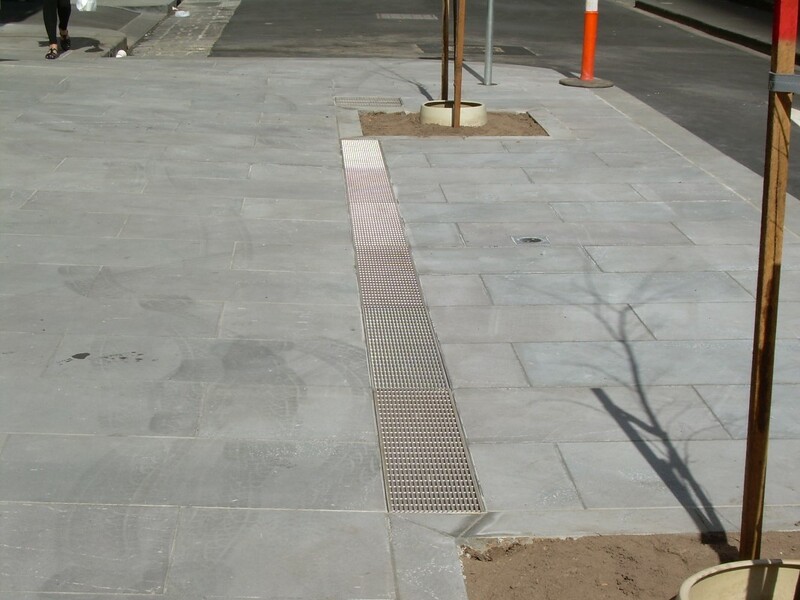 This project was completed by City of Melbourne staff and contractors. The State Government of Victoria was our funding partner. This greening project cost a total of $650,000. We carried out a traffic study in 2011 that showed that Godfrey Street had low levels of traffic. In 2012 we studied the impact of different options on traffic in surrounding streets. This analysis showed that complete closure of the street would have too great an impact on surrounding traffic flow. However, it was feasible to close one lane. We developed concept designs to help engage local resident and business owners about the proposed changes. We held a number of consultation sessions where local residents and businesses were invited to participate in developing the designs. When designing the new streetscape, we considered the impact of the street on surrounding area. The proximity of Godfrey Street to Southern Cross Station inspired the use of a green façade on the Donkey Wheel House building. The station is the gateway to the city for many visitors and workers each day. When fully grown, the green façade will be visible from the station, creating a welcoming entrance to Melbourne’s central city. Melbourne’s central city is a densely developed area and there are many underground services providing electricity, gas and telecommunications. We worked around these existing services when designing the size and location of the structural cell channel in Godfrey Street. Our study of traffic in surrounding streets influenced our designs. We were considering completely closing Godfrey Street, but the impact on traffic would have been too great. Our study showed that trucks require a wide turning space due to a centre median tram stop on Bourke Street. This meant that we had to incorporate a turning arc for long vehicles into the open space at the end of Godfrey Street. Because a large number of trucks use Godfrey Street to unload goods, our designs had to include loading zone parking. This meant that we could only widen the pedestrian area at the northern end of the street. One of our main objectives was to create a welcoming, safe space in Godfrey Street. To achieve this, we upgraded the street lighting so people felt safe in the area late at night. 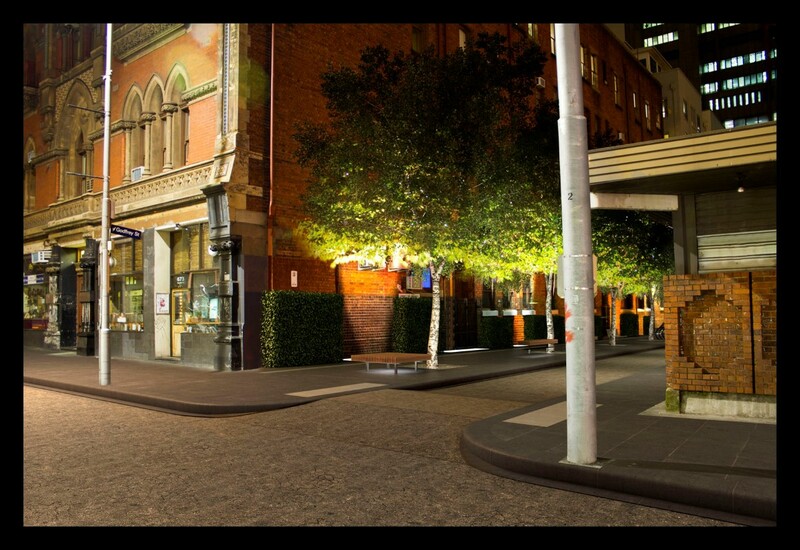 The innovative LED lighting system installed in Godfrey Street is the first of its kind in a Melbourne laneway. 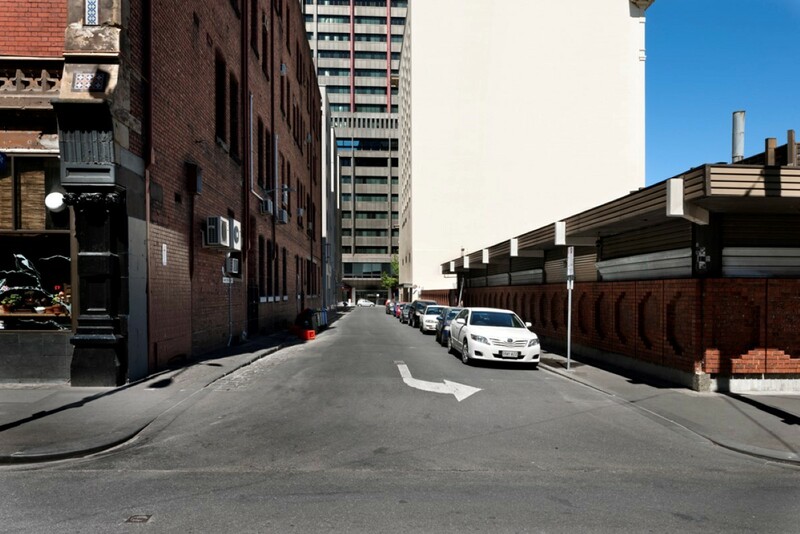 It shows how we can make laneways more accessible, with minimal environmental impact. As part of the concept design process, we worked closely with building owners, businesses and owners corporations’ representatives. We held a consultation session for community members to share their visions and concerns, and received largely positive feedback. We also asked every property owner, resident and business in the street for feedback on our concept plans. It was overwhelmingly positive, so we didn’t make any design changes. We also provided all stakeholders with final plans before construction began. The most important part of this process was ensuring that local residents were aware of the changes and our desired outcomes. Although loss of parking wasn’t raised as an issue during consultation, it became an issue after construction. Delivery vehicles were parking on the new pedestrian areas, or across driveways while loading, preventing access for residents. We resolved the problem by strategically placing street furniture and targeted enforcement of parking restrictions. We removed one lane of the two-way street to double the amount of pedestrian space and plant new trees. 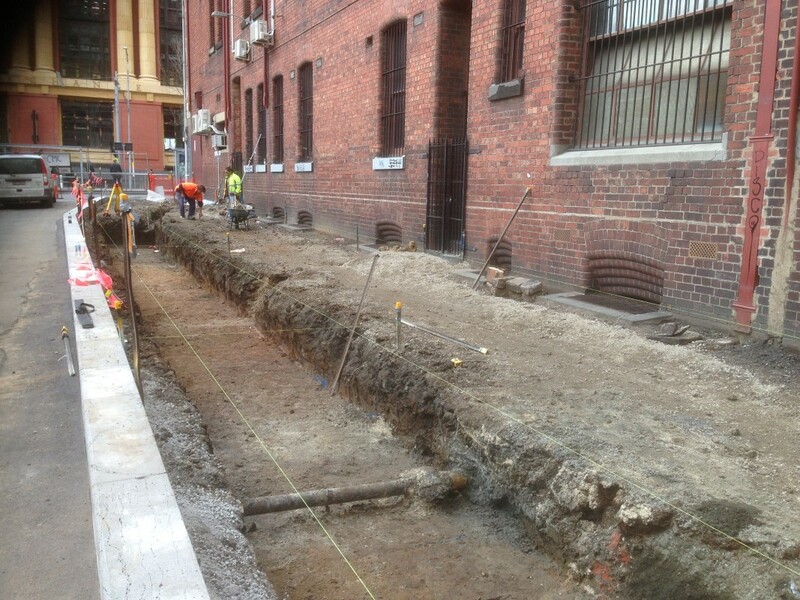 We also excavated a channel beneath the new pedestrian area. 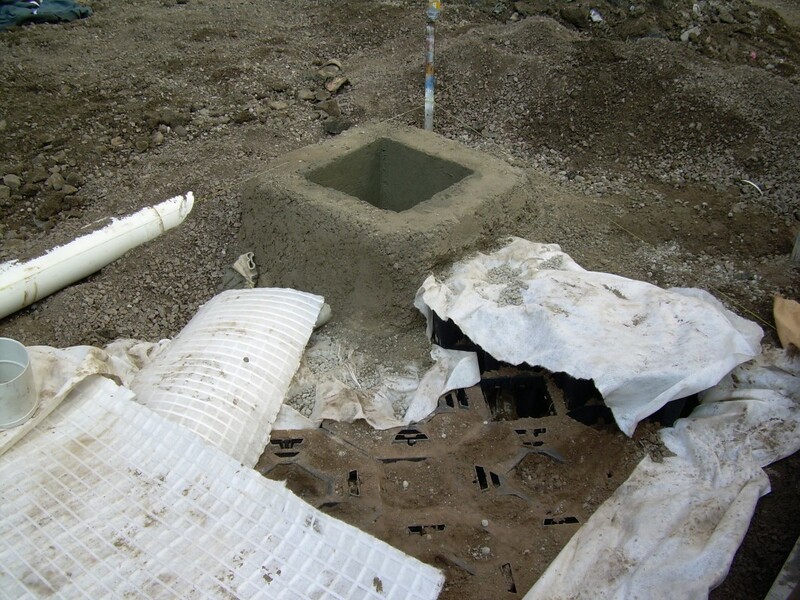 This was lined with geotextile fabric and filled with structural cells and soil.We planted street trees at intervals along the channel and diverted downpipes from the nearby building roof into the channel. The area was then paved with bluestone and street furniture was installed. The system makes use of the existing downpipes from the adjacent building. 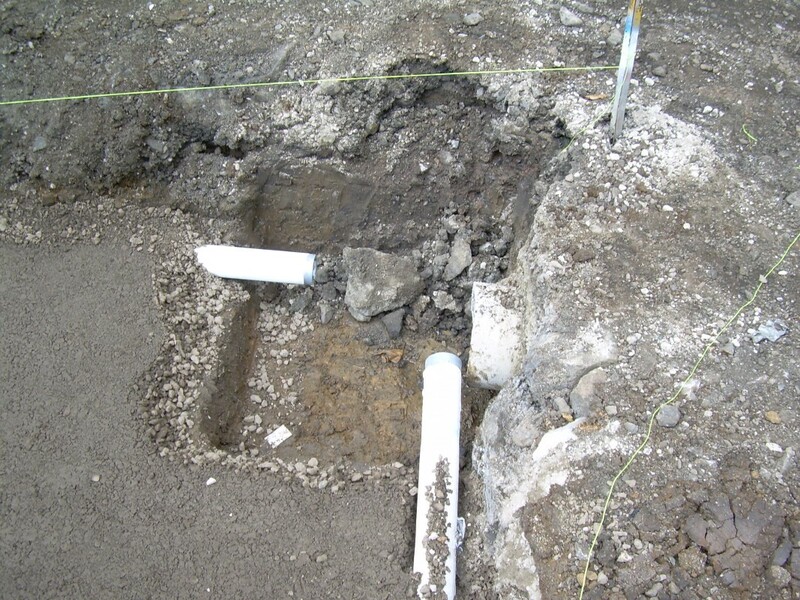 A channel is dug for pipes that will collects water from the downpipes and divert it into the system. Runs parallel to Godfrey Street, 0.5 metres from the kerb with a slight angle down to the south. We planted the trees in a long, underground trench rather than in individual pits because the increased soil volume allows for better root growth. Water is able to flow along the channel through, ensuring that all of the trees are passively irrigated by the rainwater. The structural cells retain water in the soil, making it available for the tree root systems and providing prolonged water after a rain event. The compacted soil gives the structural cell modules stability and increases the load-bearing capacity of the matrix. The soil is used to fill the space around and between the structural cell modules in the channel. We compacted the soil into the channel, in and around the structural cells. 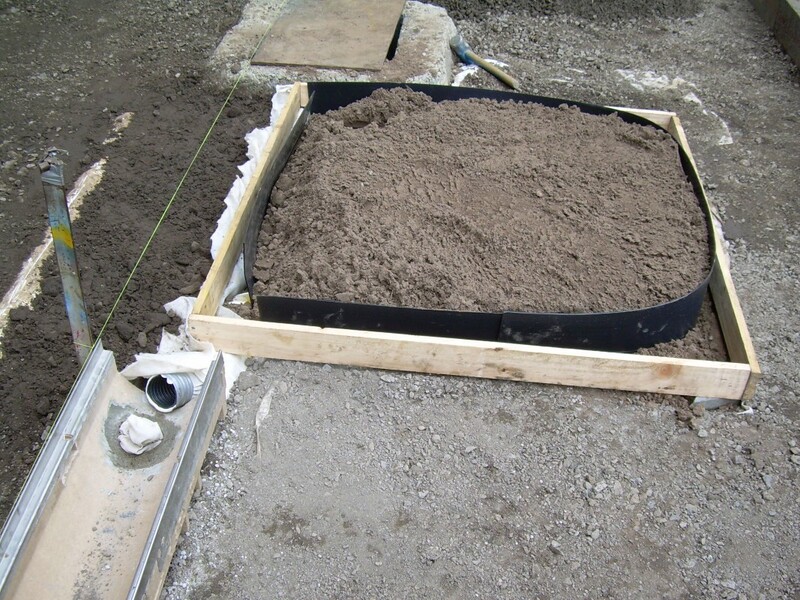 The structural cells were then vibrated to shake the sandy loam into any gaps, and more soil was added. This was repeated until there were no spaces and the trench was completely stable. Water from the downpipes flows into the two drainage pipe lengths that run horizontally under the footpath and is evenly distributed throughout the channel. Slots in the bottom of the drainage pipe allow water to be dispersed into the strata cell matrix below as it flows down the length of the pipe. 90mm sleeved UPVC water infiltration spreader pipe with slots facing down. Two lengths of drainage pipe sit on top of the structural cells, running the length of the channel. To provide an ideal growing environment for the new trees. The moist soil encourages healthy root growth, which in turn encourages healthy canopy growth. 60 cm deep and 120 cm along each edge. To prevent the tree roots from growing into the drainage pipe and blocking the flow of water into the soil. Bluestone pavers are set down on a reinforced concrete slab, covering the channel and the entire open space area. Porous bluestone paving was not necessary here because the pavers drain to a grill that allows the water to flow to the channel below. This feature turns regular pavement into a permeable surface. The grill allows water runoff from the bluestone pavers to flow down into the trench. To grow plants that will climb up the wall of the Donkey Wheel House building, creating a green façade. The bed is also used to grow herbs for the café next door. 4 metres by 0.5 metres and 0.5 deep. Filled with sandy loam soil and various plants. A drain pipe allows excess irrigation water to flow back into the channel. The planter bed sits flush against the wall of the Donkey Wheel House, level with the pavement. The Godfrey Street Greening project requires very little maintenance. We monitor the downpipes to ensure there are no blockages. During times of drought we may have to manually irrigate the trees to ensure they continue to grow healthy and cool the surrounding area. 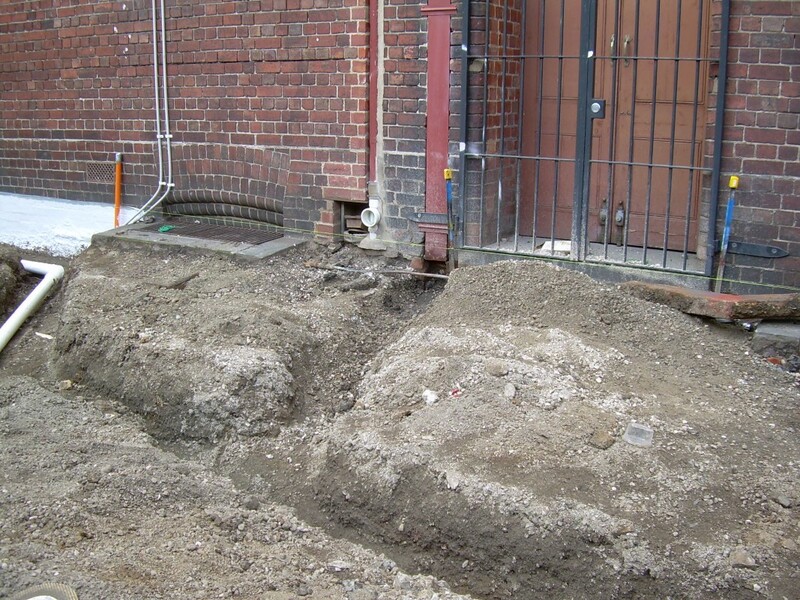 This regular maintenance is carried out as part of the existing open space management contract at the City of Melbourne. The owners of a cafe on the northern corner of Godfrey Street were involved in discussions about the upgrades. They were enthusiastic for the boost that it would bring to their business. The main purpose of the new garden bed is to grow the plants for the green façade, but it is also used by the café to grow herbs. We have a cooperative maintenance agreement with the cafe. The owners are responsible for watering the vegetable bed and green façade plants. This has fostered community ownership of the project and reduced our maintenance work. We will use the health of the new trees in Godfrey Street as an indicator of the project’s success. All rainwater falling on the roof of the Donkey Wheel House building will be directed to the trees. They should grow healthy and strong in the moist soil. Have the streetscape changes improved amenity in the area? Does the greening provide workers and visitors at Southern Cross Station a better entrance to the central city? Is Godfrey Street more pedestrian friendly? As part of the concept designs, we created a number of access pits that allow us to monitor water quantity and quality. This cheap and easy inclusion means we don’t have to pull up the bluestone paving to gain access – saving money and hassle if monitoring is required. Click through the sections below as you go on a self-guided walking tour of Water Sensitive Urban Design in the Melbourne central city.